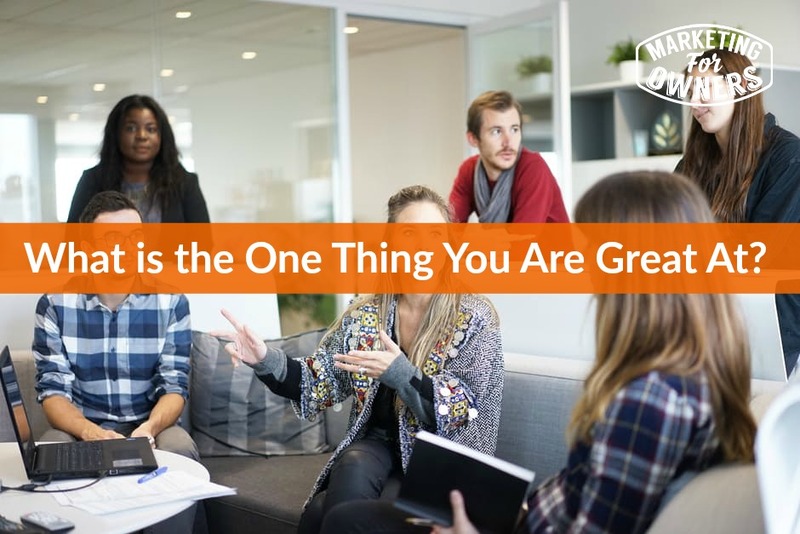 Today, we’re talking about what’s one thing you are really good at. And what I mean by that is like your super power. Because in work, in your business you have, if you are not doing it now, if you started the business from scratch, you will have undoubtedly done everything. Even Richard Branson did everything. When he started his business, his mail order thing. In school he was doing it. He worked from his house mailing out and they were stuffing things in envelopes, posting them out. He was there with everyone doing it all. But overtime, you have to delegate. You have to let other people doing it. But what do you delegate? What do you do yourself? Now if you own a business, quite often you automatically want to do all you feel you ought to do, boss stuff? Top stuff. Most important I am the boss. But should you? Oh I am not suggesting you should hire a boss and you should be the secretary, or something like that. If that is a job anymore. You need to know what you are good at. So that you can find other people to do the jobs that you are not so good at. Because you aren’t so good at everything. So if you are a journalist, I mean if you are a Know it All, smarty pants like me, you’re probably quite good at many things, but you’re still not the best. Now honestly, I am not. And I know it. There are many things that I’m not the best at. In fact I am not the best at anything. But good enough on some things. And there are also things that I just don’t want to do. I just don’t like doing. So it’s not necessarily that they are not my super power. Super power, but they don’t make me happy doing. I want to enjoy my work. So when I start on Monday morning, it’s great. Now I run a business, so weekends are kind of the same as the weekday, often. So doesn’t work like that. But Monday, start of the week, I want to look forward to it. I don’t want to be annoyed. I don’t want to think, ‘Oh’. So how do we do this? Now first of all, there are the easiest ways, there are some personality tests. Because I can guarantee if you’ve never done one, you, you probably have suspicions of what you like, but you will have your eyes opened to find out what you’re like. Now you may have heard that these things can be tricked, and so on. But they can be tricked by people who are trained to tricked in and who are trying to trick them to prove they can be tracked. However I have done various ones. I’ve done others tests, and they come out the same. I am not trying to trick them. I don’t know how people do it. I don’t care, I just take it as it is. First one first. Myers Briggs, you can just google it. There will be a free Myers Briggs test online somewhere. Your results will come out, personally I am an INTG. So look it up. So that means I, so if you are an ENTG, the E stands for Extrovert, I stands for Introvert. Yes me, look look look, I am an introvert. Well really. So, and I can’t remember what the others stand for. But all I remember is Bill Gates, Steven Hawkins are in there with me. So pretty cool. But anyway I am an INTG. I have also recommend Sally Hogshead’s Fascinate test. There is a code which I think is, you go to her How to Fascinate site. The code is MFO, for Marketing for Owners, O being the letter. If you go in there, you get a freebie. Pretty cool. So go do that because otherwise they charge. And the other one is Kolbe. K-O-L-B-E. Setup by Kathy Kolbe, run by her sons I think. I think it’s very strongly used by strategic coach by Dan Sullivan in that. I’m an 8742, and I can’t remember what they all mean but the four numbers are out of 10. If you’re 10 in one end, on you know you are likely to be higher in those. Which means, I am a kind of a planner, I am a detailed person other than some people who just dive in and get on with it. Well they call a quick start. There would be higher numbers on their last two. And so some people would be, say 2 3 8 9. And that means they are the opposite of me in that they don’t plan stuff, they just get on with it. Quite often that’s a good thing. But it’s good to know how you are. So if you’re not a planner, then why not hire someone who is, someone who can project manage. Because you will not enjoy having to set up and organize projects. And your business is one project after another. Consisting in every project consists of mini projects. There are things that have to be done. Otherwise, then go back and listen to my Monday’s show that said have you let complacency set in. So if you are a detailed planning person, you don’t need other people that are. You need people that complement. Don’t hire mini mes. In fact if you go to the Sally Hogshead one, because she devised her whole system. She explains how it came about and how this works, and how she applies it. She used to think she’d hire people that are just like her. But now she hires people specifically for the gaps that she’s got. And she’s very successful. Built a whole business out of it. How about that? So you need to find your power. What is it? When you started the business, you perhaps, let me suggest, perhaps you worked for someone else. And you sat there and you thought. I can do this better myself. I can do this. Now maybe you are in an engineering company, where you’re in the sales department. Where you’re in the management or where you’re on the shop floor, standing at the CNC machine. Now if you were standing on the CNC, using CNC machine, the likelihood is that marketing or the management wasn’t your skill. I mean it might be. You can develop it, everyone has to start somewhere. But it might not be. So accept that. And hire a marketing person. That’s what you need. On the other hand, if you were in the marketing department and you set a machine company, you probably, you can see all the guys doing it, it looks easy. But it’s not. Perhaps you need to hire an operations manager to oversee and organize that side of things because you don’t fully understand. And you don’t, not only do you not fully understand it how it works from a, you know from a really detailed perspective. But you probably don’t want to know. Or probably, it doesn’t interest you. Did it interest you before? No. is it going to interest you now? You’ve got a lot to do. So find the superpower. Find what it is. Someone like Richard Branson. Eventually it came out, he is the visionary for the business. He has a position. Now I’ve read enough of his books but I can’t remember if he’s ever said it. But he’s obviously good at setting up teams. Hiring the right teams to form a new business. He’s obviously good at picking the right business with a new approach. And that is a visionary. Now you can’t have a job as a visionary. You have to be good at something. So for me, the things that interest me are unsurprisingly marketing. But at the same time, I like the process. I, so let me just get this straight. I don’t like actually making processes and I am not, I have not looked at flowcharts and mind maps and things like that. But I like setting it up and putting the pieces in place and organizing it from the top. So in my business, I am the visionary, but I am the guide who oversee it. So I think of the ideas and I help, I then put the team, talk to the team about it, my staff. And then help them get that into reality. I then guide them through. But I don’t do it. I used to, but I don’t have to anymore because I’ve filled in the roles of the people. I hire someone to talk to my staff. When I wanted to fire someone years ago, I don’t like to doing it, I’m no good. I don’t want to fire anyone. But if they got to go, they’ve got to go, because of some problem. So I actually brought in a consultant, a guy to do who still works with me, but now other people do that. I also felt that I was no good at hiring people. So I trained somebody to do it, how it should be done. I know how to do it, I just don’t, I am not very good. I don’t want to do it. I want to hire everybody, I don’t want to let anyone down. Yeah. And all this stuff. Dealing with suppliers. I am never tough enough, I’m nice to people. So I delegated that. But it’s still my decision to which suppliers we use. Because we are very loyal to them. And my answer would be, ‘Why? Have you got new prices or new products?’ and they’d say no just passing by. I haven’t got time for that. So not very friendly, I delegated that. Sorry for anyone who got that. Anyway you get why, you get the gist, if you start learning to delegate properly, and to just concentrate on your superpower, things will change. You’ll love it. Anyway it is Thursday and that means it is time for a Drive Time Podcast time. Now I am recommending today, this is fabulous, I actually re-listen to some shows. This is one you can listen to over and over. One good thing with podcast by the way, when they’re recorded they don’t have to be up to date. This is Michael Hyatt. Right, Michael Hyatt you can find him at www.MichaelHyatt.com. The guy is great. But look for the show, ‘This is your Life’. Now he actually stopped recording them towards the end of 2016. But he put together some of the best ones because he’s got on what he call hiatus, he’s devising a new way of doing podcast. But it doesn’t matter. There’s so much material. They are all relevant. They are really good, like I said, I’ve just gone and listened to ones, I’ve listened to before. 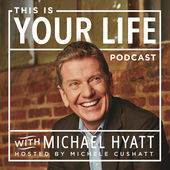 So Michael Hyatt ‘This is your Life’. You are going to love it. And remember tomorrow, Friday. Very special show. John Warrillow is going to show you something that may open your eyes to new way of doing business. Okay, you’ll enjoy it.